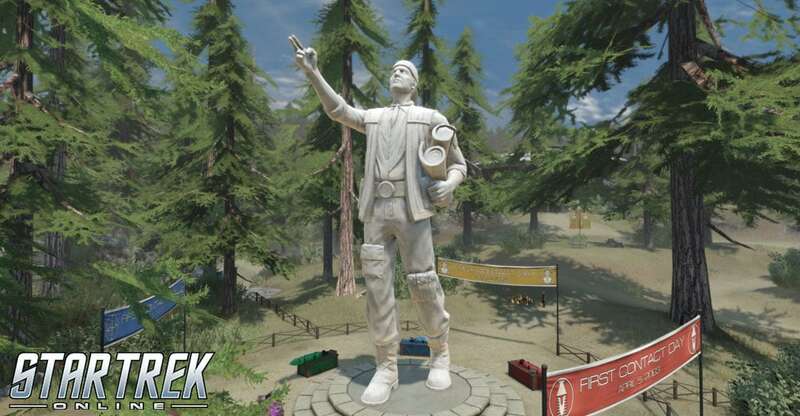 To celebrate the anniversary of First Contact Day, the Zefram Cochrane Memorial and Historical Museum is holding a special re-enactment event from April 4th at 8am PT to April 11th at 10am PT on PC, and April 11th at 8am PT to April 18th at 10am PT on Xbox One and Playstation 4! Participants are invited to visit Bozeman, Montana—the site of Cochrane’s launch of the first Human warp-capable ship, the Phoenix—and engage in the construction of their own replica Phoenix! Captains of level 10 and above may participate in this event—even captains from the Klingon Defense Force, Romulan Republic, and the Dominion are welcome to join these festivities, as a celebration of diversity and the meeting of different species. Celebrate the historic launch of the Phoenix year round with this special device! Upon activation, it places a model of the Phoenix in front of you, which quickly launches in the sky. Archaic weaponry of this type has seen a curious resurgence via the popularity of a number of holonovels that depict ancient periods of Earth's violent history. This particular weapon has something of a cult following among avid fans of the "Dixon Hill" holonovel series which rose to prominence after the publishing of an unauthorized biography of the Starfleet career of a former captain of the U.S.S. Enterprise-D, Jean-Luc Picard. Though only a replica, this item has (perhaps unwisely) been fully modified to act as a corollary to modern weaponry, and may be used effectively in modern combat scenarios. It features multiple fully automatic firing modes. We hope to see you all in Bozeman to once more celebrate one of the most defining moments in the history of the galaxy we live in!